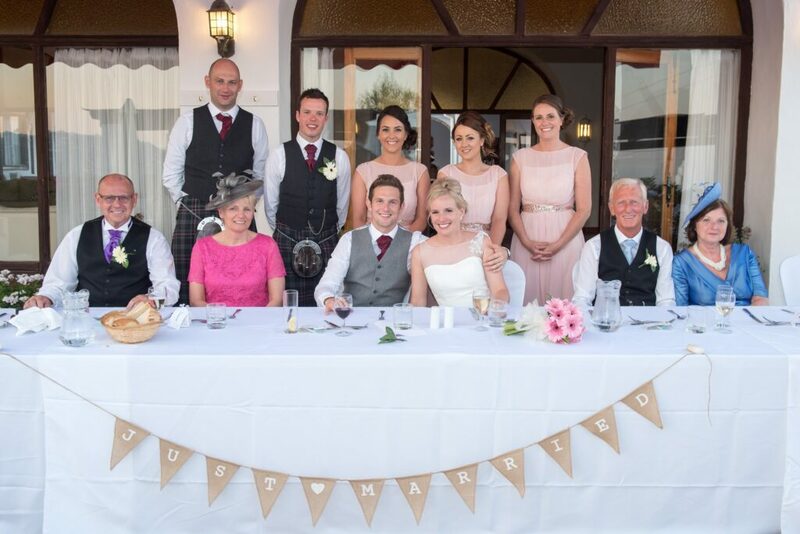 In Part 1 we met bridal couple Ashley and Ross, who had always dreamed of a Scottish villa wedding in Nerja. Proud Scots, they planned to combine a traditional Catholic church wedding honouring their Scottish traditions, with a typical Spanish wedding in Andalucia. We had found our couple the perfect church in Nerja in which to marry, just a five minutes drive from our wedding villa in the hill top village of Frigliana. Ashley walked down the aisle to a harpist playing Canon in D, resplendent in her scooped back white gown with sheer detailing and her beautiful long veil, with her hair expertly styled by our makeup artists and hairdresser, Verity. She was accompanied by her three bridesmaids in blush dresses, followed by two tiny flower girls. The ceremony was so special, and we smiled to ourselves as the guests filed out of the church…twenty five men in smart kilts a surreal sight in the quiet Spanish village square! Back in the villa, friends and family were treated to an array of Spanish tapas-style canapés by the villa’s catering team, headed by Simon. They were seated in the cobbled terrace, overlooking the mountain vista, and enjoyed a starter of Soup or Melon with local Jamon, Sea bass or Chicken, followed by Lemon Chill or everyone’s favourite, Chocolate Brownies. The villa was decorated in shades of pretty pink and white, and when it came to the cutting of the cake the couple opted for a spectacular towering ‘cake’ creation of cheese assortments, which double up as a cheese platter in the evening. The evening was rounded off with plenty of games, a long bar set up around the pool complete with frozen beer glasses and lots of laughter. The Nerja villa is the perfect place to party, and this Scottish wedding was made even more special by Ashley and Ross’ friend being a DJ and getting the guests up on their feet and dancing (we were able to hire all the equipment so that he didn’t have to bring anything out with him).